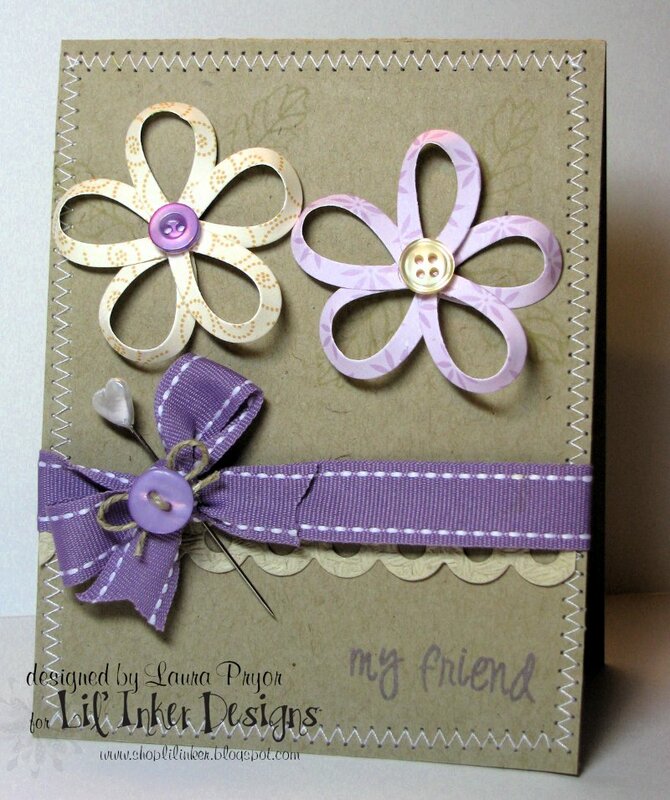 Lil' Inker: Lil' Inker Designs Blog Hop! 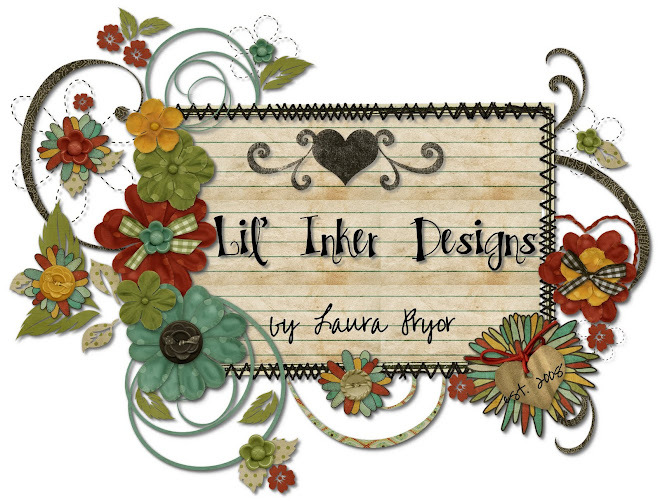 Lil' Inker Designs Blog Hop! WELCOME!!! TODAY IS THE DAY!!!! I've been looking forward to this day for some time now. Today is the first group post with our newly established Lil' Inker Design Team. Each designer has prepared a fabulous project featuring our most recent release, Rainbows & Clouds dies and coordinating stamp set and I couldn't be happier! The hop starts here on my personal design blog, hops you through each designer's blog and then to the shop blog where I will announce the fun prizes you can win for hopping along! 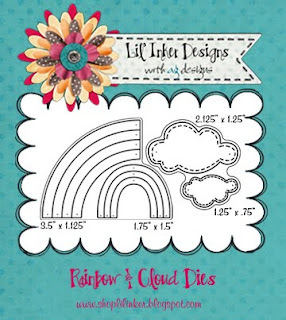 Here is a list of our designer's blogs where you will find beautious projects featuring our Rainbows & Clouds dies and coordinating stamp set. Please take your time and visit them and leave them some love! You will have a whole week to leave comments on all twelve blogs in order to be eligible to win a prize. I have a couple of projects to share with you today. First up is a project featuring the larger, arc rainbow from the die set as well as our large cloud die. I started with a kraft base and stamped the *thank you* sentiment from the Rainbows & Clouds stamp set in multi-colors and added in my rainbow and popped up the cloud on a foam square. I added in the ribbon and embellishment, rounded the corners and called it done! I just love how easy it is to create a cute card having a great focal point like the rainbow! This next card shows the versatility of this die set! I LOVE using die cuts in creative ways! You can make these fun little flowers by bending the bows of the rainbow into a petal shape and gluing them together with glue dots. Here I used buttons as the flower's centers. I started again with a kraft base and stitched a border on it using my sewing machine. I stamped some fun leaves from a PTI set that I have which I thought coordinated nicely with my whimsical flowers. I added in the purple ribbon and embellishment as well as an eyelet border in this fun, rope textured paper and I used the *My Friend* sentiment from the set. I hope these cards inspire you to create with this fun set! The die set contains 2 dies which each cut 2 unique shapes: 2 rainbows and 2 clouds. The stamp set contains 20 sentiments in a fun handwriting font which can be mixed and matched to make all different saying. I can't tell you how much I love having this set in my collection. These clouds with the perforated detail are just so super cute! 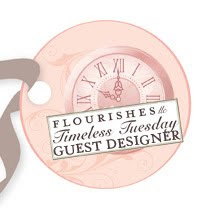 Now, for more hopping delight...head on over to Julie Ranae's blog to see what she's designed for today's blog hop. Don't forget, in order to be eligible to win a prize you must leave a comment on each blog. You have until 11:30 p.m. Monday 8/14 to comment so take your time and enjoy! See you at the shop blog where I will tell you a bit about the prizes we have for the lucky commenters! ENJOY!!! And thanks for stopping by today!!!! adorable card Laura, luv the flower one, you know I will be making one of those...hehehe...thanks girl! Beautiful cards, Laura!! I love how you created the flowers on the second card!! I am a sucker for anything flowers and I have a card using the rainbows to make flowers but I saved it for later! hehe I love how simple you kept both of these....all that color on kraft. I love that little stick pin on your flower card! Thanks for letting me be a part of this wonderful team! Super, super cute cards!! Great sets!! Awsome cards. Thank you for sharing. Wow, Miss Laura, these are both so Adorable and Super Creative! Thanks so much for the inspiration! How cute! LOVE kraft cards and the bright rainbow sure makes it "pop"! What a beautiful cards. How creative to use the bows and make flowers of them! Beautiful cards! I love the flowers you created! Great inspiration!! Great cards! Love how you turned rainbow stripes into petals! I love the pattern paper rainbow! I adore the stick pin on your second card! Great addition! very creative flower designs!! can't wait to hop around to the other blogs! Great projects Laura! I am loving what I see so far! What cute cards - I love the kraft background, it really helps the colors pop! These are both ADORABLE - but I really LOVE the rainbow one!!! Love kraft paper too! I love your cards! 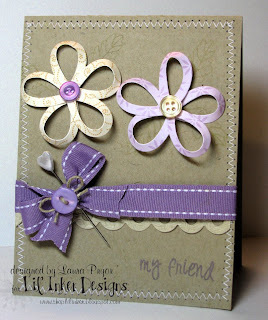 Those stamps and dies are great and the pink bow is the sweetest touch! Your cards are amazing and love the dies and stamps. I just love rainbows! Can't wait to see all the amazing and creative projects using this set. Loving the thank-you card....So many of the sentiments in the set could work it that template! Awesome!!! super cute cards! I do not have an Lil' Inker products but I love the cloud dies with the faux stitching! New to your products, but I love your card and the dies are so pretty!! Very cute cards Laura!! I love the flowers on the 2nd card and the beautiful colors you used!! The rainbow of sentiments on the side of the 1st is the perfect accent too! Wonderful! So cute! I really love these dies! Wow! Love your creativity! Using pattern paper for the rainbow is genius! And the flower???? Never, ever would have thought of THAT! These are amazing!! The first one is my favorite.. I just love the rainbow, and how you placed the sentiment down the side of the card...so cute! These are gorgeous, Laura! I love the repeating sentiment on the first one and I've got to try those flowers on the second card! Awesome projects. The stamp and die set is so cute. Love the non-traditional use of die from the DT. I love how you manipulated the rainbow into a flower. It is just adorable!! Super cute cards! LOVE the stitching detail on the cloud die and how you can mix and match lots of fun patterned papers to make adorable rainbows!!! Gorgeous cards, especially the first one! Hello Laura, just love the card you designed using the patterned papers and the stitching. Just think of the possibilities of colors and patterns - can't wait to order these dies. Keep up the good work! Wow..so cute, Laura! That flower one is just brilliant. Laura, your cards are amazing, but the creativity you've showcased with the dies in your flower card is simply outstanding! Awesome cards, Laura! Love your rainbow thank you sentiments and cute flowers! Your bows-with-buttons-and-pins are super-cute, too! love how you showed us that the rainbow die can make flower petals! Versatility is the name of my game...thanks!!!!! What a great way to work outside the box! Love the flower petals! 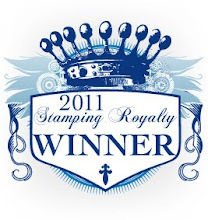 Thank you for making such wonderful product for us "real" stampers! I love it, and your projects too. :) Thanks Laura! Can't wait to see what everyone has made with this set! Super cute and unique dies! Off to hop! Finally I've got time to hop, hop, hop! I love your cards Laura - the rainbow of thank yous in the first card is great and the flowers on the second just show how fab these dies are. Wonderful cards! I really like the use of the ribbon and your creative use of the rainbow die cut! Fabulous cards--I like how you made the flowers. Wonderful cards! Love the paper pieced rainbow and those flowers are so clever! Very cute! Great idea to make flowers out of the die as well. adorable and so much fun! These are SO cheerful and bright! I absolutely love the versatility of this set...especially the flowers you created from the arcs of the rainbow! HOW AWESOME!!! What a wonderful die set and the stamps are cute to boot! Thank you for sharing - can't wait to see more from the Lil' Inkers!! Fell in love with this set the first sample I saw on SCS when it released! Awwww!!! 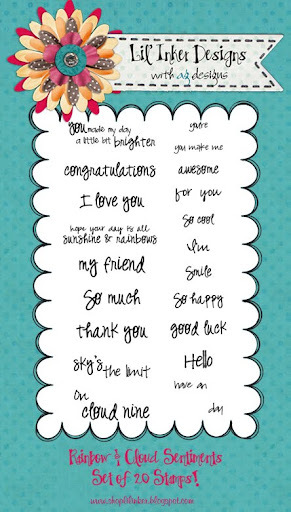 I love your rainbow card with the rainbow colored thank you's all the way down the side. SO pretty!!! What wonderfull cards, like the colour-combinations you made very much.....off to the next hop. Your cards are soooooo cute! I love the idea of taking the bows to make flower petals! Super cute cards! So exciting!!!! Very cute cards. Love the idea of bending the rainbow parts to make a flower. Brilliant!